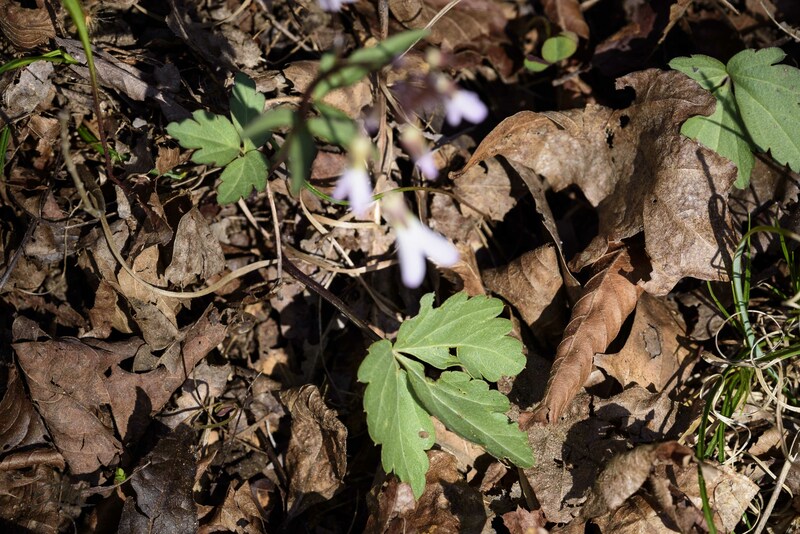 Forest floors in the Maryland piedmont are carpeted now in spring ephemerals. 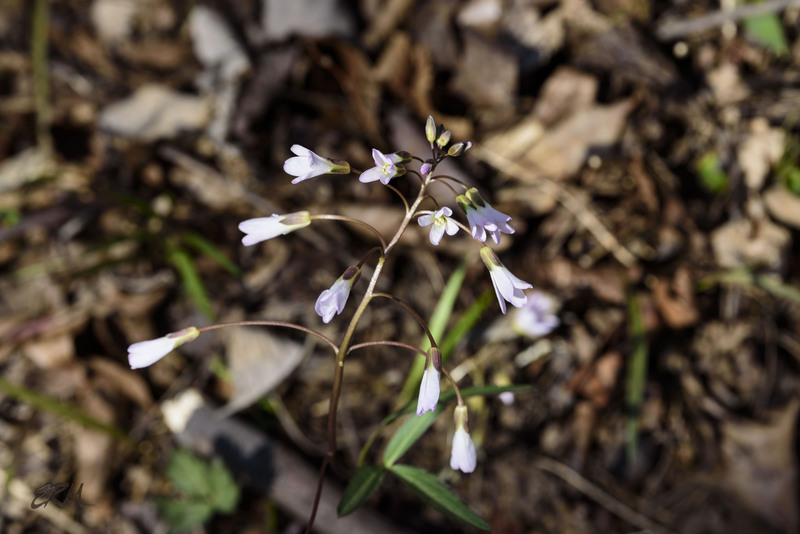 Spring beauties are everywhere, Virginia bluebells and Dutchman’s breeches seem to be confined to wetter areas, and in drier areas, you’ll see toothworts. Formerly placed in the genus Dentaria, toothworts are now lumped with the bittercresses in the genus Cardamine. 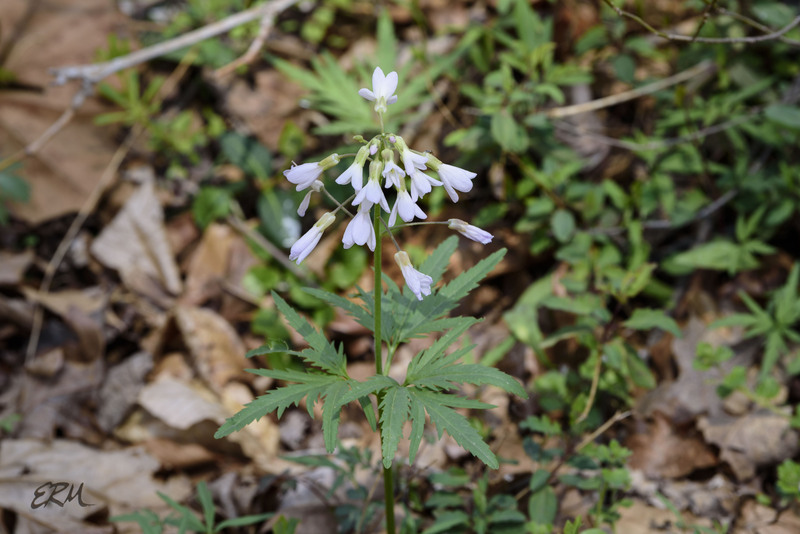 The flowers are similar on close inspection but the overall difference in appearance between toothwort and bittercress plants is pretty obvious. C. dissecta has a limited range, from Alabama northeast into West Virginia, and is endangered in Indiana. C. maxima seems to have disjunct populations in Kentucky, Wisconsin, Michigan, Pennsylvania, and a few parts of New England; it’s threatened in Michigan, endangered in New Jersey, and possibly extirpated in Maine. Neither of these species has been reported in Maryland. 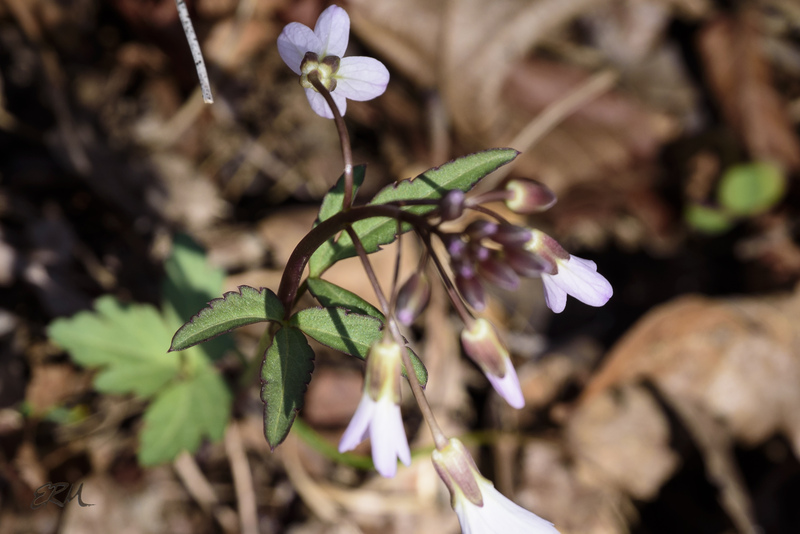 C. diphylla is found in the Appalachian South, the mid-Atlantic, New England, and upper midwest, possibly with a few occurrences farther west, from Arkansas to Minnesota. MBP has only a few records in the piedmont, and a few more in the Appalachian Plateau. One of the records is of a sample in the Norton-Brown Herbarium; it was collected in 1974 “[o]ff beltway exit to Great Falls near Seno [sic] Canal”, which is right along the Potomac gorge and my usual hunting grounds. Maybe I have a new quarry to track? C. angustata is a southeastern species, ranging from south-central Alabama north to central Indiana and northeast into Pennsylvania. In Maryland it seems to be found mostly in the piedmont. C. concatenata is found mostly in the mid-Atlantic and mid-west and New England, though it does range into the South and the eastern Great Plains. It’s endangered in Maine and New Hampshire. It seems to be in most of Maryland except the far west and southern Eastern Shore. 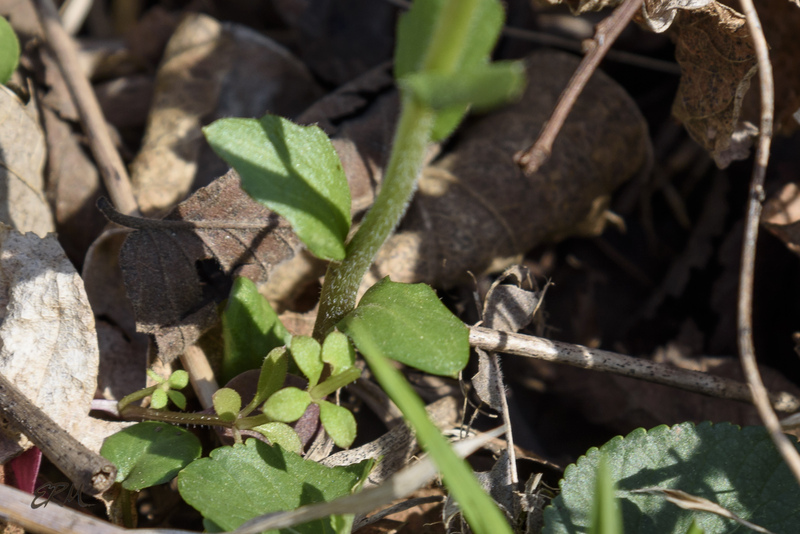 The flowers of all of these toothworts are very similar in size, shape, and color, and can’t easily be used to distinguish between the species. It’s best to look at the leaves. C. concatenata has no basal leaves present at blooming; on the stem is a single whorl of three leaves, each leaf palmately divided, with serrated leaflets. It’s worth noting that there seems to be a wide range of morphological variation: on some plants the leaflets are quite narrow, while on others they’re rather broad; on some plants there are three leaves in a whorl, but on other plants they might be sub-opposite, or there might be only two leaves. Be that as it may, C. angustata is pretty easy to distinguish from C. concatenata. It has two alternate or sub-opposite stem leaves, each with three leaflets (usually) that are quite narrow and serrated to some degree. The basal leaf (sometimes leaves) is large, with very broad leaflets, on a very long petiole. 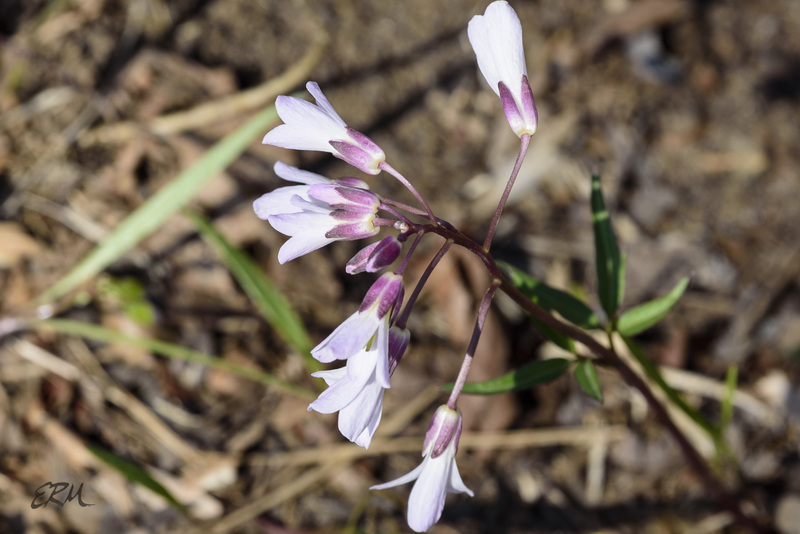 Another species worth mentioning is Cardamine bulbosa, commonly called spring cress or bulbous toothwort. 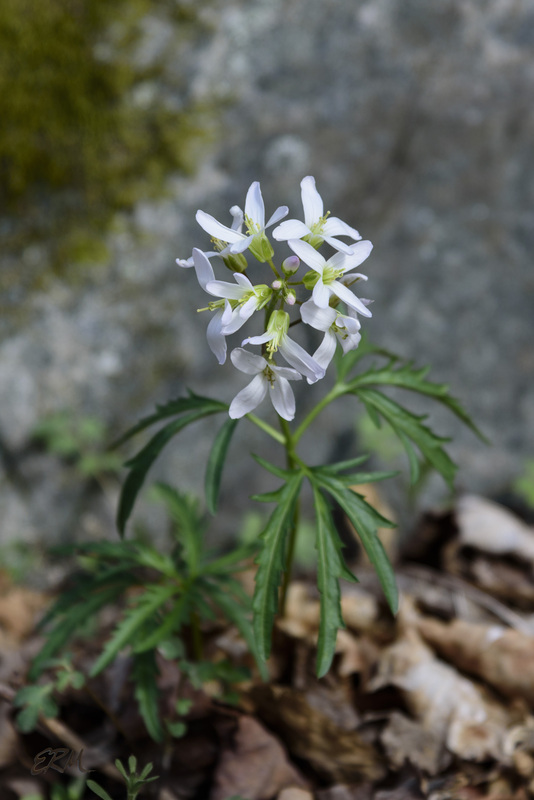 Although it was never a Dentaria and is more often referred to as a bittercress than a toothwort, the flowers look toothwort-y. The species is found in most of the eastern US (and most of Maryland), but not in Maine, and it’s endangered in New Hampshire. 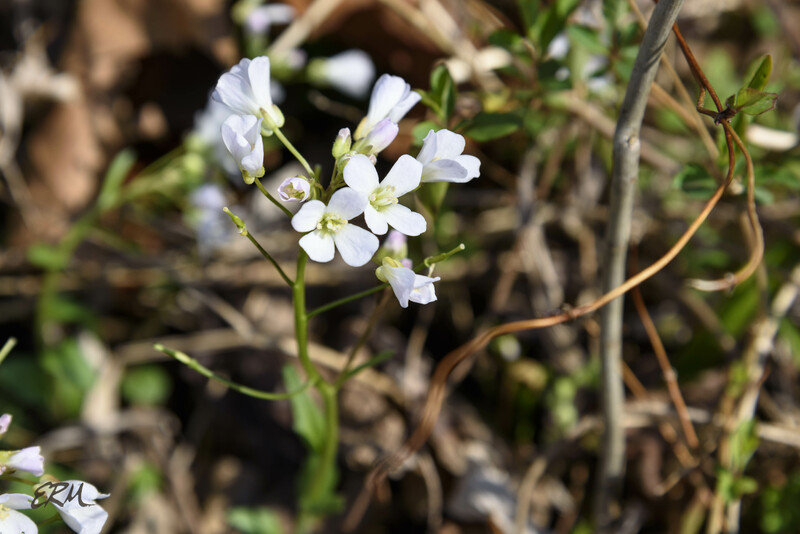 This entry was posted in Uncategorized and tagged Cardamine, Dentaria, plant ID by elizabeth. Bookmark the permalink. 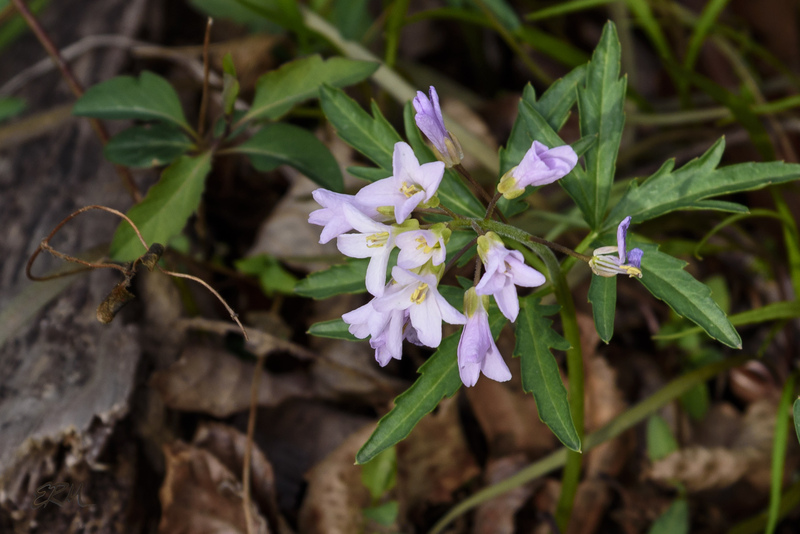 I’ve only ever found one stand of Cardamine bulbosa. It’s blooming now, about halfway between Carderock and Old Angler’s, where the canal widens and always has water in it. If you go down off the towpath there, through a field of twinleaf toward the river, you come to a pond, and it’s there. Do you see it often? I’ve only seen it once. I know the area you’re describing but don’t go through there very often; will have to go check it out!